The Quaid brothers combined their shared passion for their local community and the Motor Company to start Quaid Harley-Davidson more than 20 years ago. Their first store was located in San Bernardino, but a few years later relocated to their current location in Loma Linda. 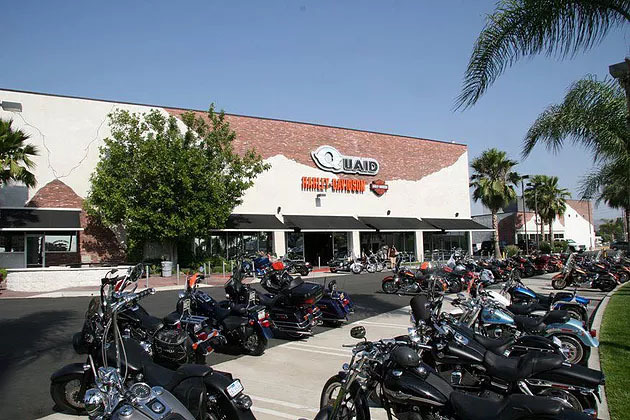 In addition to providing outstanding customer service to their local Harley riders and enthusiasts, they have the spirit and pride of local business owners. They constantly give back to their community by hosting events and charity rides to support the local Ronald McDonald House, Children’s Hospital, Veteran’s Medical Center and giving to troups stationed overseas. It’s hard not to like these guys and the family-centered community they’ve created. As a 2nd generation Quaid owner, Brandon Quaid, wants to ensure this culture lives on for many generations to come and he does so by protecting the Quaid culture through quality relationship-driven marketing. He knows that he sells a premium product with the Harley brand, but one of his objectives is to increase his local market share by increasing the frequency of visits from his current and past customers, and generate more business through referrals from his local customer base. One of the marketing channels that generates the highest ROI is email marketing. 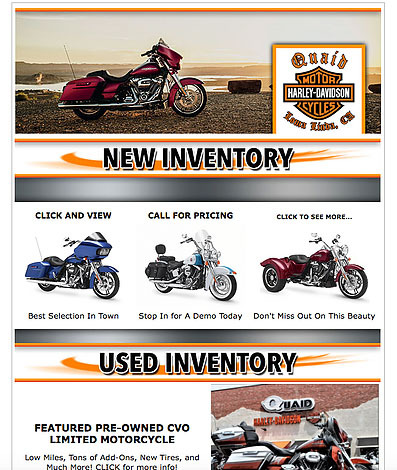 Brandon was no stranger to sending quality emails to his customer list, but prior to using the powersports-themed email templates in Firestorm, he was not getting the kind of return on his email marketing investment to drive more business. So in May, he switched over from his previous email provider to the Firestorm email system available in the Local Web Dominator program and sent four great emails to his entire customer list. While email marketing is well known for its relationship building components, the real magic in email marketing is driving traffic to a dealership’s website…and having that traffic result in LEADS. That’s exactly what happened for Brandon when he started using the Firestorm email system. In May, his website traffic increased by more than 13%, and of that increased traffic almost 11% of that was from email marketing alone. 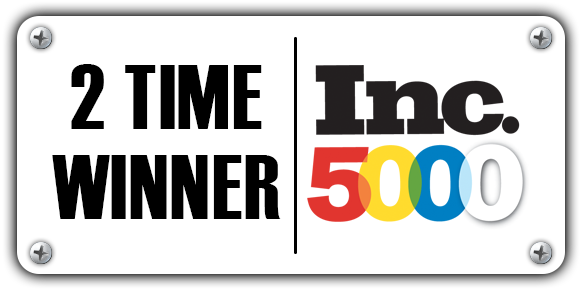 In addition to the excellent increase in overall website visitors, the traffic from the Firestorm emails generated 52 Lead Forms or Finance Apps submitted. 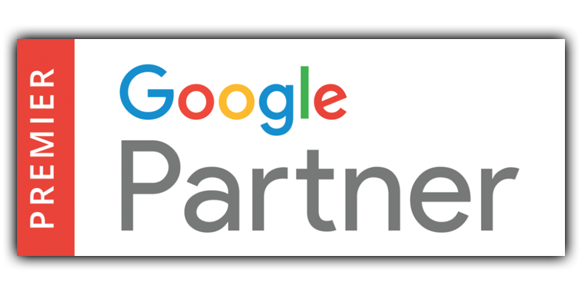 That’s more than the Pay-Per-Click, Display Network and Social Media campaigns combined! Check out the chart that illustrates the website traffic spikes after each email was sent. Plus, the email results are strong just as stand-alone data points: Average Open Rate of 19.5% and the average Click Through Rate (CTR) of 17.75%! That type of return on investment allows Brandon to increase his local market share by re-activating past customers and drawing repeat customers to his website and ultimately into the dealership. By sending quality emails that promote events and charity rides and are themed to speak to the Harley-Davidson enthusiast, Brandon is systematically increasing website traffic, online leads and building lasting affinity with his local Harley owners and enthusiasts. Does your email marketing program generate that kind of quantifiable ROI? If not, give us a call today to see how Firestorm email can make a huge impact in your website traffic and online leads: 877-242-4472.